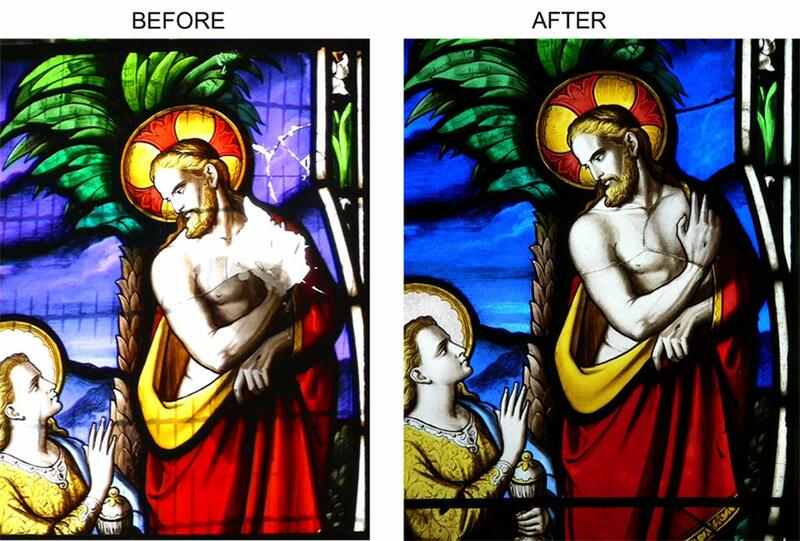 Ideally all stained glass should be protected. Polycarbonate sheeting is airgun proof and selective modern materials have improved much in recent years. It can look unsightly on ancient buildings and an alternative is stainless steel wire-mesh grilles,powder coated black. These are proof against most hazards but not against airgun pellets. Often architectural considerations and the age of the building are deciding factors as to which materials are best for a particular situation. We are always happy to give advice. 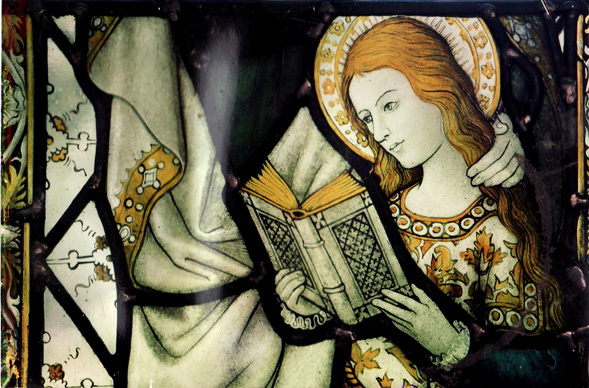 Damaged window - "St Ann teaching Mary to read" at Echinswell Church, Hants. 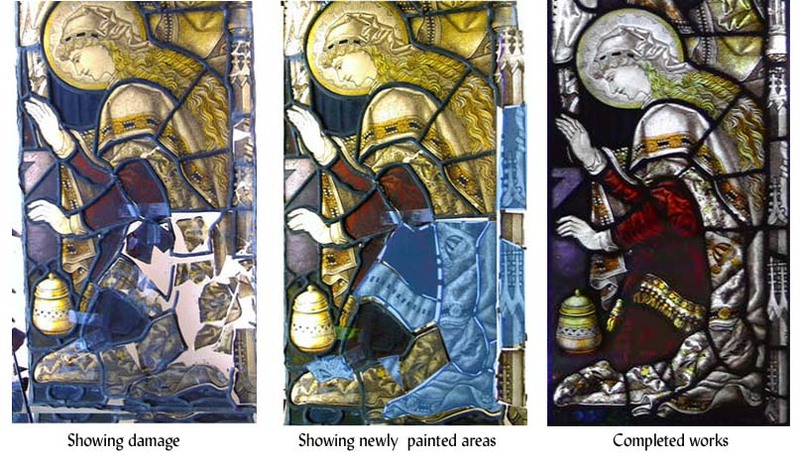 An important part of my work is involved in the conservation, care and repair of historical stained glass. It is important to keep up to date with accepted methods and new technical developments. Stained glass can be a remarkably durable medium but it needs care and maintainance to ensure its preservation over time. The useful life of glazing lead can be typically between 100 and 200 years. As the lead decays, the waterproofing breaks down causing leaks and draughts. The glass becomes loose in the leading and may start to crack. Faced with this sort of deterioration, windows should be releaded before even greater damage occurs. Generally during the initial inspection we make a detailed record of the condition of a window. While the work is in progress records are kept and these go towards making a final report with photographs for the client's record. 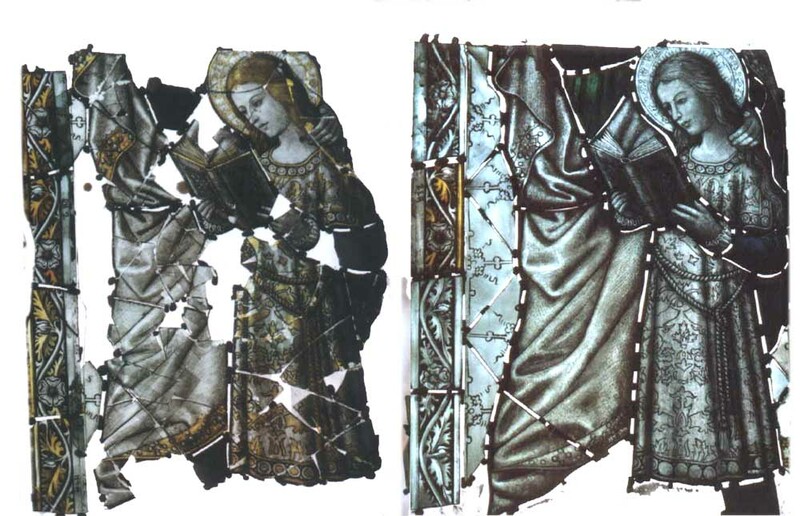 When painted glass is broken, all fragments should be collected as they will be vital to the conservator/restorer in reconstructing the image (A photographic record will help as well). Sometimes ethical decisions must be made as to how many of the fragments can be reused or whether new pieces should be repainted as replacements. Skillfully matched paintwork may sometimes be used to replace pieces damaged beyond repair. This shows a detail of a serious break in the centre of the window. There were various other smaller holes in the window and it was necessary to remove the whole light to do effective repairs. I re-painted the whole top section of Christ's head and torso (one piece of glass), but eventually only replaced the missing area, thus retaining as much of the original glass as possible. 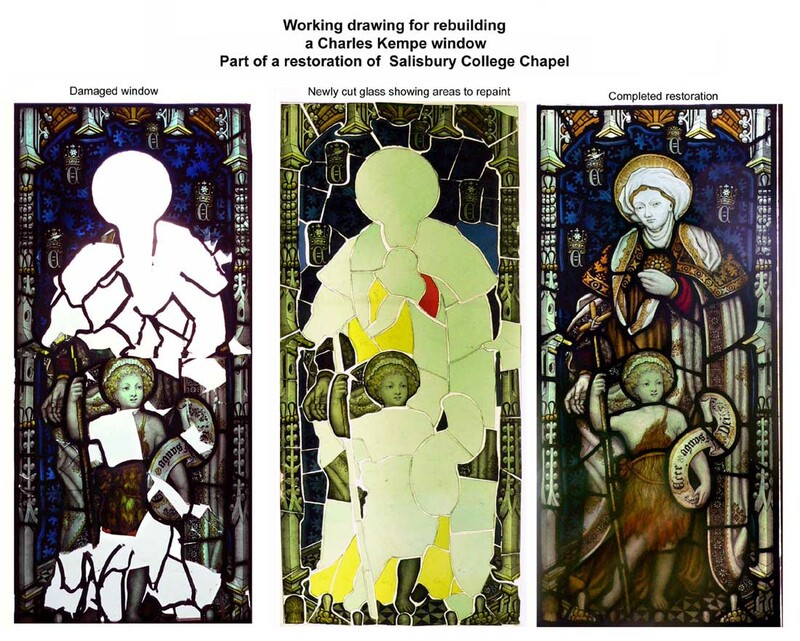 The rebuilding of a Kempe window which had had the figures almost entirely vandalised away. Fortunately there was a faded photograph which enabled me to recreate an accurate reconstruction of the original. Ihis is often the best solution for protecting older and medieval glass. This involves a type of double glazing by fitting specially prepared clear glass into the original aperture to seal the opening and the old glass is resited about an inch inside this protective shield. Air can circulate between the surfaces and so prevents condensation forming on the old glass. 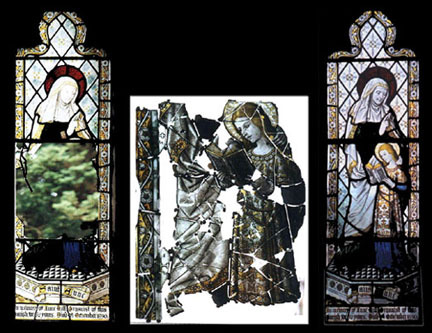 Dampness can be corrosive and is a prime cause of the deterioration of paintwork in stained glass. Please enquire for more information. It is strongly recommended that a photographic record be made of all the stained and painted glass. This is probably more easily done with modern digital cameras and wherever possible record close-up details of the heads of figures and inscriptions which are likely targets for vandals. These are a great help to the restorer if glass is damaged or lost. Dated photographs can also provide a valuable record in monitoring changes and decay over a period of time. We can offer a photographic service at a reasonable cost to complete your archive if this has not yet been done. 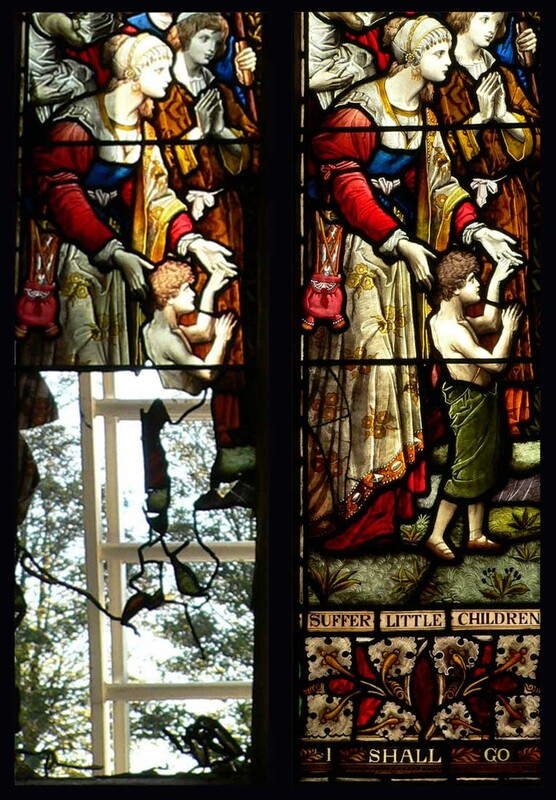 Cleaning stained glass, dealing with eroding or flaking paintwork, bulging panels etc,, are other typical maintainance problems one encounters with old windows. They should be dealt with by those with the appropriate knowledge and experience, or at least expert advice should be sought before any action is taken.